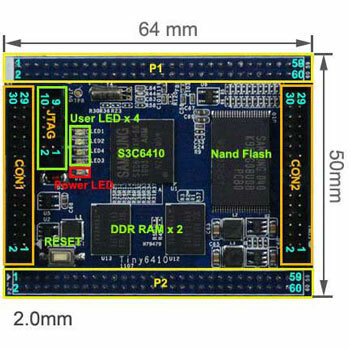 The Tiny6410-CPU processor card features a Samsung S3C6410A ARM11 CPU running at 533 MHz, and has external 256MB DDR RAM, 2GB NAND Flash, four user LEDs and a reset button on board. It has a 10-pin 2.0mm-pitch JTAG connector, two 2×30-pin headers for mounting onto a motherboard, and two 2×15-pin 2.0mm-pitch GPIO headers. This is the same CPU module that comes mounted on the Tiny6410 development board. For the exact pinouts, see Chapter 2 of the Tiny6410 Kit's Hardware Guide. CoreWind also offers customer design service based on the CM-Tiny6410 board according to customer’s requirement. Whether you need to reduce, add or modify to existing hardware, CoreWind will help customers with expert competence and rich experience.